Is your website loading slow? Really? Do you know, what can happen if your website is loading with a one-second delay? 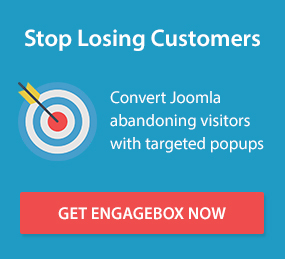 You can lose 7% of your conversions. You are helping your competitor to grow faster than you. And this is just a one second delay. And a few extra second delays in website loading can damage your website as well as your business. So, now you must be aware that how important it is to have a fast loading website to grow. Fast loading website is also vital to rank on Google as well because page load speed is also considered as a ranking signal as well. Why website loading speed matters? How to make my Joomla site load faster? It is true that slow loading speed kills conversions. If you are purchasing something online and you are just getting loading and loading. Would you wait for it? I am sure, you will not and will go to another website to purchase that item. Same will do your customer as well. As per the Crazyegg, 47% of consumers expect websites to load in two seconds or less — and 40% will abandon a page that takes three or more seconds. So, to retain the potential customers, you have to make your website load within 2 seconds otherwise you are losing your potential customers even without visiting your site. Now, the question is how to check Joomla website loading speed. There are a lot of online tools available in the market to check your Joomla site speed globally except China. These tools help you to analyze your website performance and give you actionable information to assist you in improving website speed and make it load faster. Optimization Suggestions like optimize images, Leverage browser caching and few other with how to instructions. GTmetrix is a fantastic tool that gives you a report about your website that how well it is performing and provides you with actionable tips to optimize your site for fast loading. GTmetrix not only checks your website loading speed but also check your website for YSlow matrix and assign your website grade between A to F.
Its reporting is divided into six parts. Pingdom speed test is a popular and well-known tool to test website speed online. This Joomla speed test tool allows you to check website performance from 4 different locations. The results of a Pingdom speed test provide you with performance insights, similar to Google Page Speed Insights with actionable recommendations. Its report is divided into performance grade, Load time, Page size, Requests by content type and domain. All the Joomla speed test tools work same, but the difference is that some provide more information and more functionalities. Same Web Page Speed Test is also another tool mentioned in the article, but it offers you 40 locations and around 25 browsers including mobile to test your website performance. Same the way, it also breaks its results in different parts on the based on various performance tests. It is not that favourite tool as compare to others, but it is too powerful comes with lots of features. It offers you to test your Joomla website from a different location and different browsers. You can also check mobile loading speed with the help of Uptrends. These are the some of the best tools to check loading performance of your website. But if these show you that your site is loading slow, then the question is how do I make my site load faster? So let’s check out. Enabling Joomla cache can help you to reduce the loading time of your website when a user visits on your site. If you enable the Joomla cache, the system stored all the static elements on visitor’s hard drive or temporary storage. So when the visitor returns on your website, if all the parts will load from your temporary storage instead of the server, it takes less time to load your website. In technical terms, the next time, when visitor visit on your website, his browser can load the page without sending the HTTP request. Earlier we have written a full detailed guide on how to enable Joomla cache. You can check it out if you don't know. Web hosting is an integral part of the website. If your website hosting is not good, you will face lots of downtimes, and also the performance of your website will be down. If you are not choosing a good web host, it doesn't matter how much you have optimized your website. You will end up with server downtime and slow website loading speed. So before choosing a hosting for your website, consider checking the following things. The public reviews on social media, forums. Never trust on less reputed blog’s reviews. Most of the times these are sponsored reviews. Never go with cheap or free web hosting. They can damage your website. Don't forget to compare the shared and dedicated plans. I will recommend you to go with dedicated plans. Of course, they will be expensive, but they are worth to buy. The smaller your web pages, the faster they will load. Compression is the latest technology to load the web page fast. Joomla offers you the functionality to compress your files before sending to the visitor with Gzip compression. It reduces the page size and makes your Joomla site load faster. To enable the option, please go to "System → Global configuration → Server → Server Settings", find the option “GZIP Page Compression” then enable it. We have a detailed article on how to enable Gzip Compression on Joomla site. Have a look at it. Images are the most critical part of the website. But these are also the primary factor to slow down your site. But removing images is not the solution. Because if we take an example of an e-commerce website, can you imagine the conversion rate without having the excellent quality of product images? It will be damn low. So you can’t go without the photos. You have to optimize the images so these can be load fast. There are numerous online tools available to compress the images without losing the image quality. If you are a photoshop user, consider saving the image Save for Web and Devices. Avoid using a .png image unless these are necessary. Smush.it is also a great tool to compress images. CDN stands for Content Delivery Network. CDN is the most useful way to improve a site’s performance. But the question is how a CDN make a website load faster? As the name suggests that it helps you to deliver your content to your visitors. Beyond the server that hosts your website, you can use another server as well to decrease the loading time of your website. And it is possible with the help of a CDN. It helps your website by shortening the distance between a visitor and the server delivering your content. CDN cache your website on a global network of servers. And when a user visits on your website, it delivers the content from the nearest location of the visitor instead of your web host’s place. So it will consume less time, and your website will load faster. Cloudflare - Comes with Free and premium features. This is the time to show more creativity on your website. And to make your website more creative, you need to use different CSS and JS files. This will lead to increase the website load time. Because they will block the content from rendering before they are executed fully. But luckily, we have a solution for this. You can compress these files. Once you have squeezed all your CSS and JS files, this will remove the lots of white space from your files, but also it will affect the code readability. So if you want to edit your code again, you have to beautify it. But it will save a lot of sizes and will help you to make your site load faster. Most of the time, we use different CSS or JS files to develop a website which leads to slow down your site. So instead of using separate files, copy the code of all the files and create a new large file. So when a visitor visits your website, it will load only one file instead of too many. Use a defer or async attribute in the scripts to delay the execution. These optimizations can be done on Joomla template level only. So what about the files that load from the Joomla core? Don’t worry, and we have a solution for that as well. Check out the next point. You can combine the external CSS or JS files on template level as discussed in the last point. But how to optimize the CSS/JS files that load directly from the Joomla Core. JCH-Optimize - I am using its pro version and giving me stunning results. These are not only speed optimization extension but also can be used as SEO Joomla extensions. According to Yahoo, 80% of the load time of a web page is consumed to download the different part of the website like stylesheet, scripts, media etc. An HTTP request is made to download one of these components, so the more elements on a web page, the more HTTP requests required and the longer it takes for the page to render. So the first step is to find out how many HTTP requests sent when your website load and how much time it takes. If you are using Google Chrome, right click and click on Inspect or Ctrl+Shift+I. The name column will show you the files those render on the time of the web page loading. The Type Column will show you the type of the files that either it is a Stylesheet or a script or an image. The time column will show you the time it takes to load. At the bottom, you will see the number of requests the web page makes. Now, find out if there is any unnecessary request made. And if there is any try to reduce that one. Because minimizing the HTTP request can help you to increase your website performance. You can optimize the way they will load. You can load the Synchronous or Asynchronous way. In Synchronous, browser load one file at a time so if one file takes time to load it will stop loading another file and will wait for the loading. On the other hand, in Asynchronous, if one file takes time to load, browser keep that file loading and start loading other data simultaneously. Result: Your website will load fast. Yes, it is most important to have a mobile-optimized website. Your website should perform well on all kind of devices from small screen to large screen. It should load fast and should be fully responsive so it could make a better user experience. You can check your website with Google PageSpeed Insight and Google Mobile friendly Test, and the list of issues should be fixed. Images, videos, and large files take more time to load so if we host them on an external hosting platform, the website loading speed can be improved. There is the number of websites available in the market which allows you to upload your videos or images on their website and then you can use those on your site. YouTube - Allows you to upload video. Vimeo - Allows you to upload and share videos. Pinterest - Allows you to host images. Flicker - Allows you to host images. When you use any third party extension, they load their CSS and other scripts which affects your website very severely. So it is always recommended to choose less Joomla extensions and if you need to use, choose them wisely. Social Media Counter to cont the share and likes on your website. Google Analytics, Google Adsense or fonts etc. also slow down your website. So always choose lightweight extensions so your website speed could not affect. If you have renamed your htaccess.txt file to .htaccess, you can use it to add some code which tells your browser not to request specific image types from the server if they are already present on your PC. ExpiresByType text/html "access plus 600 seconds"
ExpiresByType application/xhtml+xml "access plus 600 seconds"
For more details on .htaccess file optimization, you can check this article. So if you are dealing with low website speed, consider these tips to enhance your website loading speed and increase your website performance on the search engine. Please let me know your inputs in the comment section. PS: These attractive tweetable quotes are created with TweetMe Joomla extension. Naveen is Digital Marketer by Profession, Blogger By Passion and kind by nature. He is working with JoomDev – A Leading Joomla Template and WordPress Themes development company in India. Apart from this, he loves research and convert new ideas into reality. How to Fix Broken Links in Joomla 3.X or Upcoming Joomla 4? How to Create Hidden Menu Items in Joomla With Simple 3 Steps?